ASV Holdings Inc., a manufacturer of all-purpose and all-season compact track loaders and skid steers, showcases its Posi-Track loaders in a new video series. The series, titled ASV Demo Challenge, pits ASV machines against competitive compact track loaders, comparing stability, speed, traction, cab pressurization, cooling capacity, ride quality and performance in extreme operating conditions. Each video highlights ASV Posi-Track loader features that differentiate the machines from other models, including industry-rated operating capacities, cooling systems, hydraulic efficiency, flotation, ground clearance and comfort. The ASV Demo Challenge series demonstrates ASV machine performance in a number of situations, from traction on muddy terrain to machine handling on side slopes. ASV Posi-Track loaders excel in these applications because they are designed from the ground up to run on tracks, according to the manufacturer. Each loader undercarriage features ASV's Posi-Track rubber track system. All models are independently suspended via two torsion axles per undercarriage, and dual-level suspended models also include suspended roller wheels. These features deliver a smooth ride over every type of terrain. In addition, the Posi-Track loaders' multiple wheel contact points and guide lug surfaces on the flexible track virtually eliminate track derailment and facilitate maximum performance on steep slopes. The equipment's weight balance also allows for higher performance on slopes, compared to compact track loaders from other manufacturers that are often converted from skid-steer loaders and have a heavier back end. The high number of contact points and wide tracks also provide industry-leading low ground pressures. In addition, all models have superior ground clearance, allowing the machines to work in more places, in a wider range of conditions, and more comfortably than competitive equipment, according to the manufacturer. 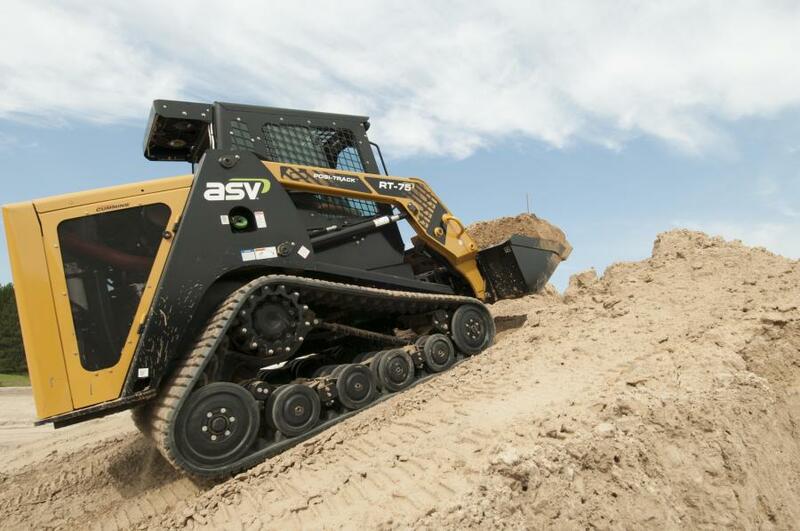 ASV Posi-Track loaders feature leading hydraulic and cooling efficiencies. Drive motors transfer torque to the internal-drive sprockets. Internal rollers reduce friction loss in the undercarriage, resulting in maximum power being transferred to the track regardless of drive speed. In addition, all machines include large line sizes, hydraulic coolers and direct-drive pumps — rather than belt-driven pumps — transferring more flow and pressure directly to the attachment and preventing power loss. Machines with belt-driven pumps and restrictions in their hydraulic systems lose as much as 30 percent of their horsepower. ASV's Posi-Track loader maximizes the use of horsepower, allowing operators to keep their machine cool and optimize attachment performance. Check out the videos below, or visit www.asvi.com/demo-challenge or follow the ASV YouTube page to watch the videos as they are released. Machine balance and stability are important factors while working on slopes. ASV builds its machines to easily handle working on slopes without requiring time-wasting techniques such as filling the bucket for added stability, or dangerous techniques such as backing uphill. Compact track loaders allow contractors to continue working where other machines cannot. In soft, muddy conditions, CTLs' low ground pressure, ground contact, and machine balance all come into play. ASV designed its machines to keep moving, even under extreme working conditions. Drawbar pull indicates a compact track loader's tractive effort and its ability to push. The more it can push, the more quickly it fills a bucket and gets work done. ASV builds its machines to have superior drawbar pull and tractive effort. ASV pioneered the concept of torsion axle suspension in compact track loaders back in the 1980's. Undercarriage suspension has always been a central part of ASV's patented Posi-Track system. ASV machines are built to provide a smooth ride and protect machines from rough bumps and vibration. Machine speed ratings are often a calculated or theoretical speed based on engineering principles, and many don't live up to the hype. With ASV, what's listed on the spec sheet is what operators will get in the real world.